Over the years, ratings in the Navy, as well as other services, change as technology advances and the needs for the Navy changes with the times. The Store Keeper rating is such a rating. 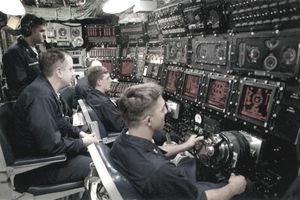 Keeping the inventory and maintaining a supply chain and storefront for the command operation and the crew needs is more technical and requires a thorough understanding of computers, databases, and logistics. Thus, the Store Keeper rating (as well as the Postal Clerk) in the Navy have merged into the Logistics Specialist Rating. The job you do in the Navy is called your rating. You might have a few specialized skills also related to that rating. For example, if a Navy police officer (​ ) receives specialized training as a K-9 Dog Handler, he/she would be awarded NEC . From that point on, the sailor could be assigned to Navy law enforcement duties involving military working dogs. The Navy Enlisted Classification (NEC) system supplements the enlisted in identifying personnel on active or inactive duty and billets in manpower authorizations. NEC codes identify a non-rating wide skill, knowledge, aptitude, or qualification that must be documented to identify both people and billets for management purposes. - Store Keepers and Postal Clerks are now Logistics Specialists. They receive basic training in supply and postal-related logistics functions. Logistics Specialists are responsible for providing exceptional customer service, operating financial accounting systems, managing inventories of repair parts and general supplies that support ships, squadrons and shore-based activities to include the Military Postal System. Advanced and technological training opportunities are available throughout your career development. There is no longer a Store Keeper or Postal Clerk Rating (SK / PC) as on 2009. - Culinary Specialists receive extensive training in culinary arts, hotel management and other areas within the hospitality industry. Culinary Specialists provide food service catering and hospitality services for Admirals, senior government executives, and within the White House Mess for the President of the United States. This rating is responsible for all aspects of the dining (shipboard mess decks) and shore duty living areas. Culinary Specialists work in the "heart of the ship," and are vital in maintaining high crew morale on ships, construction battalions and every shore base. - Ship's Serviceman are responsible for managing and operating all shipboard retail and service activities. These include the ship's store, vending machines, coffee kiosks (CVN units only), barber shops and laundry operations. They play a large role in the morale of the ship. These Supply Community jobs are critical to the military functioning with success and maintaining health and morale. Supplying the equipment, parts, food, as well as other miscellaneous necessities and entertainment make the command and deploying with the command much more bearable.